Margarita Pie Recipe. © 2013 Peggy Trowbridge Filippone, licensed to About.com, Inc. This no-bake margarita pie recipe features a pretzel crust and a pie filling made with tequila, Triple sec, and limes in a nod to the famous cocktail. The crust needs to chill for one hour before filling and the pie requires four hours of freezing time before serving so plan accordingly. Place the pretzel sticks in a plastic bag and use a rolling pin to finely crush them. Combine the crushed pretzels, sugar, and butter in a medium bowl. Press mixture into a buttered 9-inch pie dish. Chill for 1 hour. In a large clean bowl, combine sweetened condensed milk, lime juice, tequila, Triple Sec, lime zest, and food coloring, if using. Fold in 1 cup of the whipped cream. Pour into cold pretzel pie crust and freeze for 4 hours. 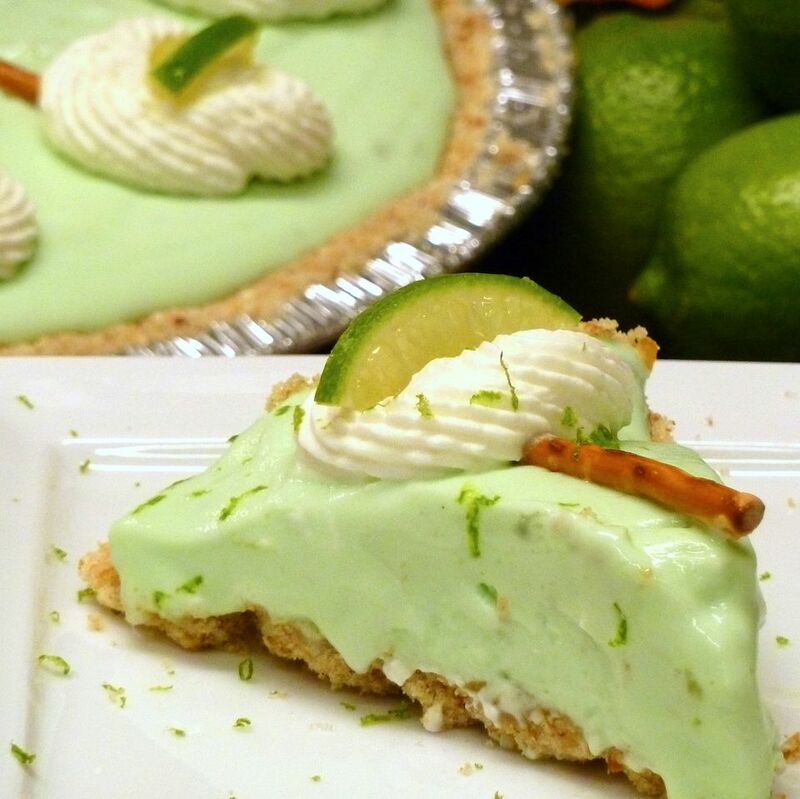 Decorate the pie with remaining 1/2 cup of whipped cream, pretzels, lime quarter slices, and lime zest. This is basically an ice cream pie, so keep it frozen until ready to serve and freeze any leftovers. Key Lime Pie Recipe: If you can't find fresh key limes, you can use bottled key lime juice often found in the canned fruit aisle near the lemon juice. This custard pie is easy to make. Key Lime Cheesecake Recipe: If you like key lime pie, this key lime cheesecake is swoon-worthy and no baking is required. Key Lime Ice Cream Recipe: If you like key lime pie and key lime cheesecake, this key lime ice cream is right up your alley. It's a custard-based ice cream with white chocolate and rum daiquiri variations. Key Lime White Chocolate Bars Recipe: Key limes and white chocolate are an irresistible combination in this sweet and tangy batter that can be turned into muffins or cake. Lime Bars Recipe: This is the lime version of those delectable lemon bars with a shortbread crust and a custardy curd topping. What is Blind Baking and Why is it Done?